Mrs. Ritchie informs me that, in the next episode of the further adventures of Marmalade the shaved cat, Marm's parents are upset that, now hairless, he rolls in the dirt and then licks himself until he makes mud. So they decided to bath him. This is a bad tempered cat who has previously been tossed into a kiddy's wading pool and a bathtub. So he is aware of water. And he don't care for it. Marmalade's dad now sports bone-deep gouges that run from wrist to elbow on both inner forearms. Eva's friend's new cat fell into the toilet the other night. So she dried her off on her brother's towel because he's the one who left the lid up. The rabbits who own the neighbourhood are turning brown. They must get pretty itchy when they shed because yesterday I watched one of them roll around on its back in a dirt spot on the neighbour's lawn. They have zero fear. They are like a lupine Chuck Norris. Bugs Bunny has always been pretty hot for a rabbit. Ooh, Marmalade is one bad beast. I feel bad for his past trauma though, poor guy. I love the Marmalade stories that Mrs Ritchie passes on, Michelle. You know it will always be something that makes you, at the very least, scratch your head. My cat likes to hang out in the shower, just out of reach of the water stream. Whe, that's a relief, Allison. I thought I was weirdo who thought Bugs has it (not that YOU'RE weird). It's largely his sauciness, I think. I have heard of cats using the loo, Barbara W, but you don't often hear of one actually flushing the toilet. Let's hope he didn't get carried away, because that's wasteful! Too bad you don't have a cat now. Those cats can be trouble ... but we still love them. I will just have to find a single, cute guy with good cats and move in with them all. Unrelated to this... I get the feeling George is in Montreal tonight to see the Habs game. Too bad I am working and without tickets. Darn! haha Barbara W - yeah those two paragraphs are totally unrelated! Darn work, interfering with life! As our business has declined, I've noticed the foxes decline also. I don't think there are any left. As a result, the rabbit population has exploded. Rabit territory is now at a premium. Consequently, the rabbits have moved closer to the heavy plant. I've even seen them inside the galvanizing line building. You are right; rabbits are very successful opportunists. I thought they were being very bold in our residential neighbourhood, but to actually move into a steel works building... watch your back! Jamie, I've given up on the carpet, and not just because of the cat stains. I hate carpet; it's a cesspool. Ours is all wrinkly, and one of these days I'm going to rip it all out. Or move. 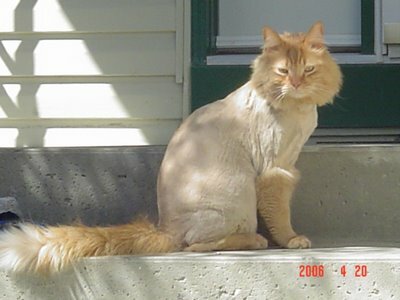 LOVE the pissed-off look of shaved cats. Hilarious! animals rolling in dirt are really funny. I was watching little birds flinging sand onto themselves the other day - it was really cute. My cat has been rolling in the dirt a lot lately. She just loves when the weather gets warm and the whole family comes outside for the day. I think she actually rolls for joy.